Find practical accessories for contact lenses like colored cases for multiple contact lens households, travel cases and lens alerts to remind you when to change your lenses. Looking for practical gifts for the contact lens wearer in your life? There are some really useful products out there to help make life easier, whether you wear disposable dailies or economical rigid gas permeable lenses that last for years, some as simple as colored lens cases your family can use to avoid putting in the wrong contacts! But I'll start with something most disposable lens wearers will find useful, including me! Do you have difficulty when it comes to how to remember to change your contact lenses? I actually use the calendar on my phone to remind me when to put a new pair of lenses in...but it doesn't always work. Why? I often forget to set the alarm! My eyes get sore and I end up throwing away my 2 weekly lenses early. I alternate between daily disposable and 2 weekly lenses in hot summer months, especially when I do watersports...so I don't then remember how many days the weekly lenses have actually been used. Here's the answer! 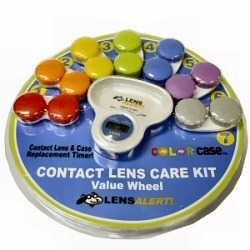 This Contact Lens Timer from Lens Alert comes with 7 colored cases. The timer lets you count down the number of days left to change your contact lenses and also your contact lens case and the colorful cases can be used by several members of the family so you don't mix each others lenses up! The best bit is you get to protect your eyes and potentially spend less on replacement contacts because you forget how often you've worn your disposable contact lenses. You can set the case change time for 30, 60, or 90 days and set the lens change time for either 30 or 14 days. Great value at just $13.95 INCLUDING all those colorful cases! This Daily Disposable Lens Travel Case from California Accessories is the perfect way to carry your daily lenses when travelling. Available in 5 vibrant colors, the case has slots for up to 16 lenses, one for each eye for 7 days plus two extra spaces for lenses that get torn or lost. It's sturdy and good value for money with a canvas interior and faux leather outer and you can obviously use it for weekly disposable lenses too, especially if you travel on long trips. 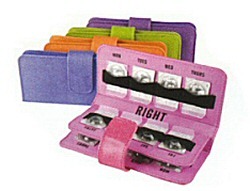 If you don't like bright colors, there are dark contact lens travel case options too. See more accessories for contact lenses products here.